With a bit of creativity, I got a free first class ticket to Hawaii added to my Europe trip. Here’s how to use stopovers and open jaw tickets to your advantage when redeeming frequent flyer miles. I’ll start out by saying I’m quite new to this whole “travel hacking” thing, and there are many out there who have much more experience than I do. But a lot of people have asked me how I get good travel deals, so I thought I’d share based on my experiences booking a trip to Europe. I hope this helps others travel more for less. It bums me out to see people who wish they could travel more but don’t think they can because it sounds too exotic or expensive. It takes some work to travel on a budget, but it’s possible. Last year there was an incredible credit card offer from Chase & BA (British Airways) that my wife and I each used to get 100,000 frequent flyer miles. This was an unusually good offer, though it’s not too uncommon to find similar offers for 50,000 miles like this one going on right now. This year we decided to take a trip to Scotland to visit friends, so of course I started looking into the best way to use our miles to do this. On most airlines 50,000 miles is enough for a roundtrip ticket from North America to Europe, so the simplest itinerary would be to fly roundtrip from LAX (Los Angeles) to EDI (Edinburgh, UK). The cheapest fare on Kayak.com for the dates we wanted was $870 each. Not bad for miles that we earned for free. That’s already a great value for my miles, but what if I wanted to maximize those miles further and see more of Europe? The first thing to check into is an “open-jaw” itinerary which doesn’t cost any more miles, but lets you fly into and out of different cities within the same region. It’s great if you want to go to more than one destination. So for example, we decided we wanted to visit the Netherlands, so we are going to fly to EDI on our way in, then catch a cheap flight from there to Netherlands (around $50 each), and then start our return journey from AMS (Amsterdam) instead. The cheapest fares I could find to do this without miles was $1670 each. What about Hawaii? Here’s where the fun starts. Usually when redeeming miles you can add a stopover for no additional charge, as long as it’s “along the way”. Hawaii is considered part of North American in terms of redeeming miles. So for the same number of miles as flying home from Europe, we can fly AMS (Amsterdam) to LAX, and then onward to Hawaii. British Airways doesn’t fly to Hawaii, but American Airlines (one of their partner airlines) does. And the great thing is that this “stopover” in LA can be many months (I think up to a year). So without adding any miles to the cost, we can add a 1-way direct flight to Hawaii for a different trip later in the year. That brings the value of those miles to over $2500 per person. 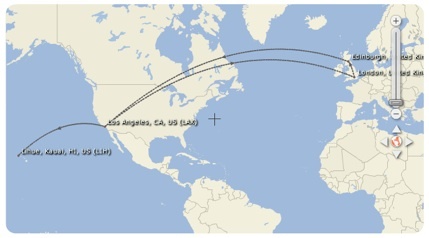 Note that the LA stopover works because it is along a “direct” route from Europe to Hawaii, my final destination. A stopover like that may not work in all cities. But don’t let that stop you from trying. A “direct” route doesn’t always have much to do with geography, but rather what cities are major hubs for the airlines you’re flying. What about the return from Hawaii? I was able to use 20,000 United miles to book our return flight separately, using half of what I would have had to use otherwise. Wait, I thought you said first class to Hawaii? Let me explain. I’ve never been upgraded to business class or first class before, despite doing a fair amount of traveling. But I decided this time to splurge and use all of our 100,000 miles (each) for this trip to Europe, giving us business class for our entire journey. I doubt we’ll be able to do this again since our daughter will soon be 2 years old (and we’ll have to get her a seat). The miles didn’t cost us anything to begin with, so why not take advantage of them? That was my thinking anyway. 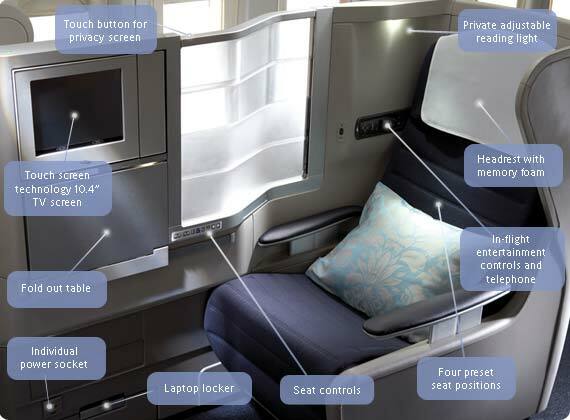 Business class on British Airways gives you a seat that lies fully horizontal, among other things. When I checked prices, business class tickets from LA to EDI were over $8000 each. The extra bonus came when booking our extra leg to Hawaii. Apparently that flight doesn’t have business class, so they had to book us in first class instead. So we got a free first class flight to Hawaii tacked on to our trip to Europe for no extra charge. If someone (certainly not me) were to purchase that LA-Hawaii ticket, it would cost over $1500 one-way. Note that you could do this same itinerary (including the one-way to Hawaii) for 50,000 miles in economy class. To book a stopover like this using a partner airline you usually need to make the booking over the phone rather than through the airline’s website. There is often a fee for making a booking over the phone, but it’s worth it in situations like this. I hope this gives you some ideas of how to maximize your frequent flyer miles. If you want to dig deeper, start cruising the FlyerTalk forums where travel fanatics discuss this stuff all day long. If you’d rather not wade through all of that, you my be interested in the Travel Hacking Cartel site which has great tutorials & links to deals. You may also want to check out this article and this article which go more into depth about open jaws and stopovers. Feel free to leave questions in the comments below and I’ll be happy to answer them as best as I can.